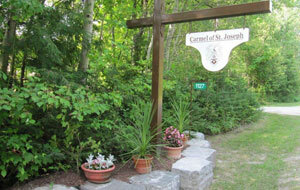 The Carmel of St. Joseph belongs to the Discalced Carmelite Order. The word, 'Discalced' means 'without shoes'. The Discalced Carmelite Nuns are a cloistered contemplative community rooted in the biblical tradition of the solitary prophet Elijah of Mount Carmel. His challenging cry: “The Lord lives, in Whose Presence I stand” (1 Kings 18:15) has become a model of life. Reformed to its original Rule and austerity by St. Teresa of Avila and St. John of the Cross, our religious family blends the hermit-life of those early prophets with a supportive community atmosphere. All this is oriented to a deep personal friendship with (and imitation of) Christ, characterized by its hidden apostolic fruitfulness for the Church and the world – So much so that if our prayers, self-immolation and whole manner of life are not according to these high ideals, we fail to live up to the vocation for which God brought us together.